Today comes another very interesting announcement coming from Coinbase that will help the adoption of Bitcoin as an alternative form of payment for products and services. 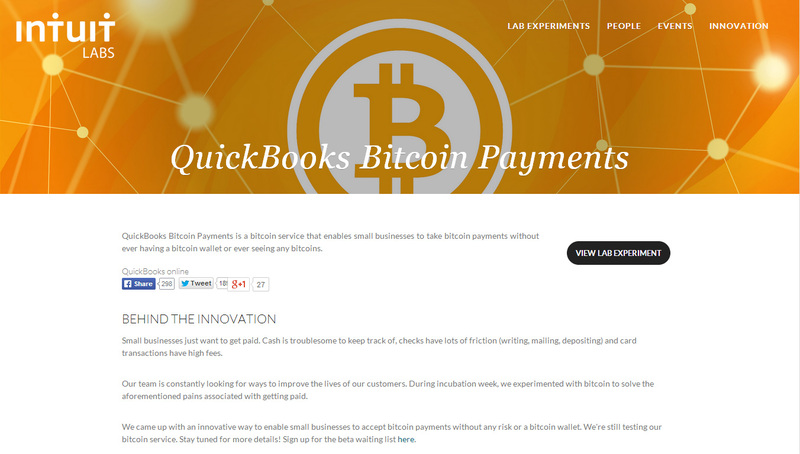 They have partnered with Intuit’s QuickBooks Online to offer PayByCoin, a new service that will enable small businesses to accept bitcoin payments. – Small business operators register with Coinbase and link their bitcoin wallet to their QuickBooks Online account. – When a customer receives an invoice, they now have the option to pay by bitcoin, in addition to existing methods such as credit cards and bank transfers. – Intuit does not currently charge a fee for this new service. Coinbase does not charge any fees for the first $1,000,000 USD in bitcoin transactions; after that, a 1% payment processing fee with be charged when converting bitcoin to USD. Just last year, Intuit processed approximately $40 billion USD in payments and by making bitcoin payment an option for the 624000 small businesses using QuickBooks Online this can significantly help in the mainstream adoption of Bitcoin as an alternative form of payment.